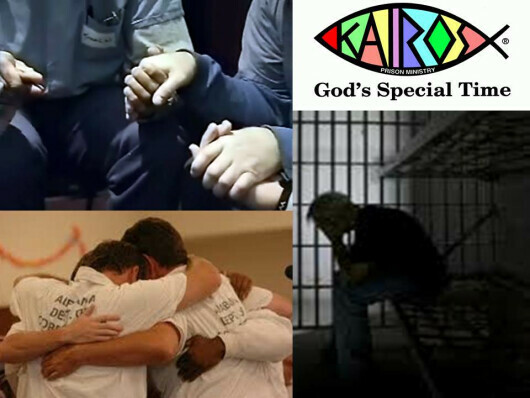 Kairos is a ministry of Christ’s love, delivered by His family to Inmates at the Pendleton Correctional facility. It is a 3 ½ day weekend where a team from the outside enters the maximum security facility to bring a planned Christian experience, lots of food, and most importantly non-judgmental love to 42 offenders who many have never experienced such over powering love. We discuss, share, sing, pray, eat, listen and show love and respect to all. There are numerous ways in which you can get involved. 2) Cookies: Chocolate chip cookies are the principal "gifts" given throughout the entire weekend. We need 3,000 dozen. Must be baked with the "exact" recipe. Do not ad lib!!! Use a #40 leveled scoop so that they are uniform size (2" Dia.). 6 cookies to 1 qt zip lock bag. Cannot be broken. Bake anytime and we freeze them. Bring to church on Sundays. Recipe and dry kits (for sale) at the table. Return baked cookies no later than Wednesday May 15, 2019 to the Church Office. 3) Cookie Bake on May 11, 2019 from 8:30 AM to 2:00 PM at the Fishers United Methodist Church - Please contact Dave Gay or Dave Pecenka for more information or to sign up! 4) Attend the Closing. You may attend (Men & Women) the closing ceremony, something which is very special to see and hear. We need you name, as it appears on your drivers license and your email address by Monday May 6, 2019. Your name will be put on the list and you will receive an email with rules of dress etc. You need to be at the facility at 12:45 PM (to 4PM) on Sunday May 19, 2019. 5) Financial Support: Each weekend costs $8,000 to $10,000. Obviously the offenders have nothing to chip in so it is up to donations from team members and outside gifts. Each team member needs to "come up with" a significant amount. Make checks to "Kairos of Indiana" with "PCF" in the memo line. Please do not give any money if it would take away from your New Hope giving! Give donations to us and we will deliver. Thank you for any support you can give us! God can make a difference in these men’s lives. Be a part of making the weekend successful. Please email Dave Gay or Dave Pecenka for more information.